From the election of Donald Trump in the United States, to Brexit and the vote against the Colombian Peace Agreement, citizens around the world have shown a deep loss of trust in their leadership and government. What has fueled this deepening mistrust, and what policies can governments adopt to ensure more transparency and accountability? 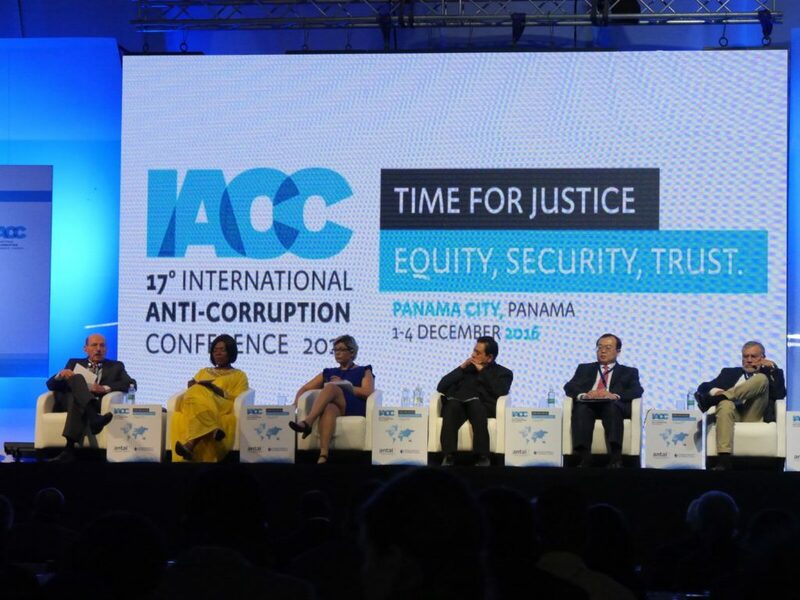 This was the focus of “Time for Justice,” the second plenary session of on the opening day of the 17th International Anti-Corruption Conference. The panel was made up of a diverse group of government officials and international organization representatives who have been promoting anti-corruption initiatives both globally and at the local level. According to Sanjay Pradhan, CEO of the Open Government Partnership (OGP), the increasing dissatisfaction with status-quo politics around the world can be linked to corruption. “The majority of citizens around the world are deeply dissatisfied with how governments are dealing with corruption. Through events like the US election or Brexit, citizens have expressed deep mistrust of their government and elites that are disconnected with their interest, or are complicit in schemes that benefit a few. That’s why this particular IACC is even more pressing,” said Pradhan during the panel. In regional terms, Chair of Transparency International Jose Ugaz acknowledged that while important challenges still remain in the anti-corruption fight in Latin America, significant progress has been made in some countries in the region. “During past decades, many high officials in Latin America had been involved in corruption, and all of them were going unpunished after tremendous schemes and scandals. But suddenly things started to change in the region, either due to external pressures or the appearance of specific personalities,” Ugaz said. According to Ugaz, one of the models in the anti-corruption fight in Latin America is Guatemala. “In Guatemala, for every ten corruption crimes only one used to go to court. [But] because of the pressure from external governments and some local organizations, a commission was put into place, with an international prosecutor who came with a group of investigators and lawyers who investigated high level cases of corruption,” said Ugaz. The International Commission Against Impunity in Guatemala (CICIG) led a corruption investigation in 2015 involving several high-level officials, and which eventually led to the imprisonment of the then-President and Vice President. When discussing specific policies to fight against corruption, Jorge Hage, Former Minister of the Comptroller General’s Office in Brazil, provided a list of basic elements that according to him have allowed Brazil to be relatively successful in one aspect of the anti-corruption fight: detecting and punishing corruption. Among these policies, Hage included granting complete independence to public prosecutors and the federal police, securing complete independence of the judiciary, and granting complete freedom of press and freedom of information. He also emphasized another key factor that is independent of political will: citizen awareness. Lastly, Thuli Madonsela, Former Public Protector for Government of South Africa, spoke about the importance of finding innovative ways to fight corruption.